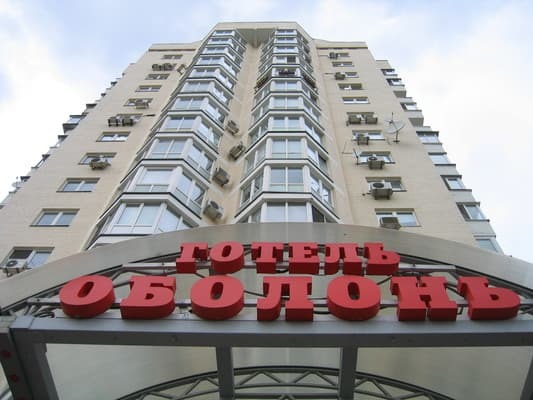 Being far from the noisy central highways of the city and combining style and comfort, the Obolon Hotel attracts numerous guests with its homey comfort. 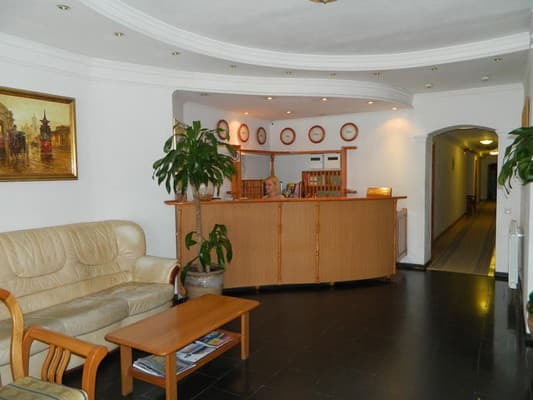 Warm pastel colors of the refined interior, high-quality furniture and sanitary ware, modern security system, individual approach to each client and a high level of service in general create an atmosphere typical for traditional classical European hotels. 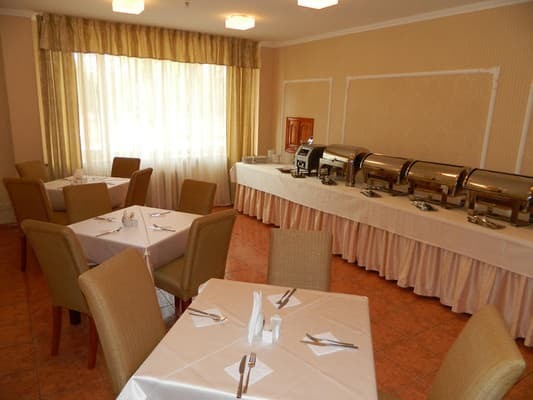 The maximum amenities created by the Obolon hotel for your stay, recreation and work, make you forget that you are visiting. Make yourself at home! 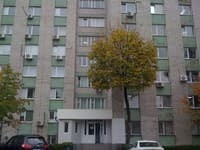 The distance to the center is 8.5 km, to the central railway station - 15.6 km, to the airport "Borispol" - 42.6 km. Description of the room: A cozy one-room apartment with a total area of ​​44.8 m2 with a view of the main street. 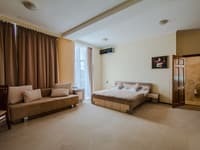 In the room there is a double bed, two bedside tables, a dressing table, a desk, three chairs, a coffee table and two armchairs, a telephone, a TV set. In the hall there is a wardrobe, a refrigerator with soft drinks. Bathroom with shower, toiletries, towels, bathrobe, slippers, hairdryer. 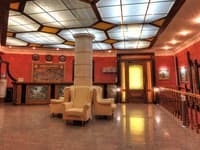 Description of the room: Cozy one-room with a total area of ​​26.4 m2 with a view to the courtyard. In the room there is a double bed, two bedside tables, a dressing table, a coffee table and two armchairs, a telephone, a TV set. In the hall there is a wardrobe, a refrigerator with soft drinks. Bathroom with shower, toiletries, towels, bathrobe, slippers, hairdryer. Description of the room: Cozy two-room suite (bedroom and living room) overlooking the courtyard with a total area of ​​40.5 m2. In the bedroom there is a double bed, two bedside tables, a dressing table. In the living room there is a sofa, a coffee table and two armchairs, a telephone, a TV set. In the hall there is a wardrobe, a refrigerator with soft drinks. Bathroom with shower, toiletries, towels, bathrobe, slippers, hairdryer. Description of the room: Cozy two-room suite (bedroom and living room) overlooking the courtyard with a total area of ​​44.9 m2. In the bedroom there is a double bed, two bedside tables, a dressing table. In the living room a sofa, a desk, three chairs, a coffee table and two armchairs, a telephone, a TV set. In the hall there is a wardrobe, a refrigerator with soft drinks. Bathroom with shower, toiletries, towels, bathrobe, slippers, hairdryer. Description of the room: Cozy three-room suite (two bedrooms and a living room) overlooking the courtyard with a total area of ​​81.1 m2. Each bedroom has a double bed, two bedside tables, a dressing table, a coffee table and two armchairs. One of the bedrooms has a balcony. 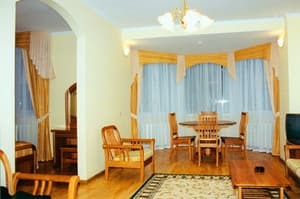 In the living room there is a sideboard with dishes, a dining table with chairs, a leather sofa, two leather chairs, a telephone, a TV set, a refrigerator with soft drinks. In the hall there is a wardrobe. Bathroom with shower, toiletries, towels, bathrobe, slippers, hairdryer. Description of the room: Cozy three-room suite (two bedrooms and a living room) overlooking the courtyard with a total area of ​​73.9 m2. Each bedroom has a double bed, two bedside tables, a dressing table, a coffee table and two armchairs. One of the bedrooms has a balcony. 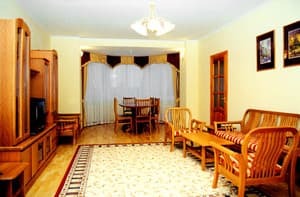 In the living room there is a sideboard with utensils, a leather sofa, two leather chairs, a telephone, a TV set, a refrigerator with soft drinks. In the hall there is a wardrobe. Bathroom with shower, toiletries, towels, bathrobe, slippers, hairdryer. 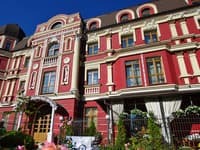 Modern building of the hotel is located in the "New sticky" - a new area of ​​the capital on the right bank of the Dnieper. 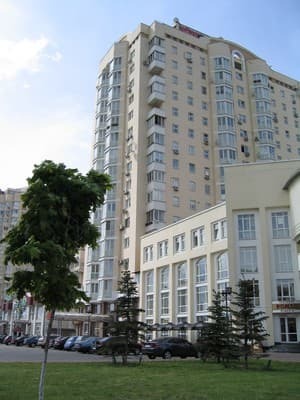 Kyiv Obolonskiy district st. Minsk metro st. Tymoshenko 29 Bldg 7. The distance to the center is 8.5 km, to the central / Railway station - 15.6 km, to the airport "Borispol" - 42.6 km. Metro "Minsk" access to the "McDonald's" in the direction of the waterfront 5 minutes from the metro.